I was so excited to pick up this book and begin to read it. I had waited so long for it and I was so certain it would be amazing (like the previous ACOMAF). Before I begin, please do not read the spoilers if you haven't read the book! They will spoil everything. Unfortunately, the first couple of chapters disappointed me. 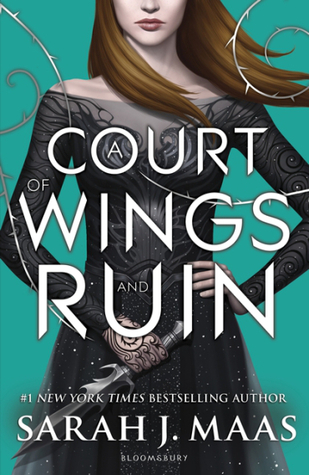 The pace was awkward, with Feyre's revenge seeming too quickly accomplished and poorly thought out (although it works out fine). I really liked the reunion between Feyre and her sisters, although it was difficult to like both Nesta and Elain at first. Nesta grew on me. In the beginning, she seemed very selfish, narrow-minded and unforgiving, but as the book progressed, I found myself liking her character more and more. She is such a badass, *spoiler alert* especially when she teams up with Elain and kills the King of Hybern! *spoiler over* Nesta is the coldest character in the whole series, but I still really appreciate her. At first, I could not see her with Cassian, but as the plot thickens, you can kind of tell that she cares for Cassian. Maybe it is the bond influencing this? They don't seem like the likely couple, but they have potential! The war has finally began and I started the book knowing someone would not make it out alive. I was (kind of) right? It was pretty much unexpected, *spoiler alert* like when Rhysand died and Feyre urged the other High Lords to save him. He survived! Yay! I was so upset when I read that paragraph when he died. I guess Sarah J. Maas didn't want us all to either 1. die from heartbreak (literally) or 2. storm to her house and kill her *spoiler over* The final battle was exhilarating to read and I could not put the book down. I devoured the last couple of chapters. Battle scenes are always so much more fun. I think Maas does a good job of making his rethink our feelings towards Tamlin in this one. My feelings towards him has changed so much. I loved him in ACOTAR, despised him in ACOMAF and finally in ACOWAR, I have mixed feelings about him. You think that he's predicable and all, but his actions were surprising. I feel pity that he hasn't gotten a happy ending (as of yet) and that he has lost his most of his friends and followers. That doesn't excuse his cruel and abusive treatment of Feyre in ACOMAF, but I feel kind of bad for him, because he does try to the the right thing in the end. The relationship between Tamlin and Feyre is strained and cold at best, but I think they can be reluctant allies in the future. “Only you can decide what breaks you, Cursebreaker. Only you." Aww thanks for the comment! I really need to read this series. I hear about it all over the book community, but have not picked it up yet. Thanks for sharing your review.